Night in the basement of a concrete structure now in ruins. It was dark—not even a single candle. The closeness of sweaty people, the moans. At that very moment, a young woman had gone into labour. In the dark, without a single match, what to do? People forgot their own pains, worried about her. The speaker, seriously injured herself, had been moaning only moments before. And so new life was born in the dark of that pit of hell. And so the midwife died before dawn, still bathed in blood. Even if we lay down our own lives to do so. The poet, writer and peace activist Sadako Kurihara lived in Hiroshima and survived the atomic bombing of August 1945. She is best known for this poem Umashimenkana, translated as ‘Let us be midwives’. The poem is based on Kurihara’s own experience in a shelter under the Sendamachi post office in the aftermath of the destruction of Hiroshima. In reality, the midwife survived and was later able to meet the child she had delivered. 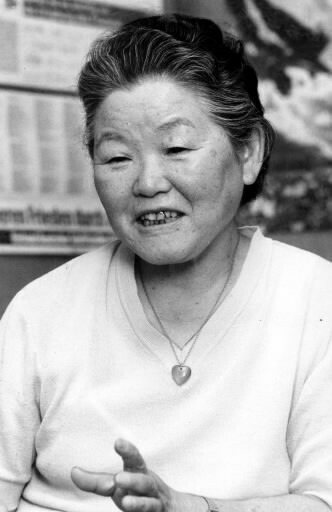 After the war Sadako Kurihara took up writing along with her husband Kurihara Tadaichi, and was fully engaged in the worldwide peace and antinuclear movements. In 1960 she wrote Auschwitz and Hiroshima: Concerning Literature of Hiroshima about the writers’ responsibility for remembrance. In 1969 she founded a citizens’ group Hiroshima Mothers’ Group against A-Bombs and H-Bombs and published an anthology of poetry about Hiroshima The River of Flame Running in Japan. The following year she started the journal, The Rivers in Hiroshima. She also edited journals, wrote essays. This entry was posted in Poetry and tagged Hiroshima, Japan, nuclear weapons, peace, Poetry, Sadako Kurihara. Bookmark the permalink.